Flowfresh MF ... installed at the Fit Fresh facility. WILL FACER, marketing manager of Flowcrete Middle East*, elaborates on the company’s tailored resin flooring solutions for various sectors. THE diversity of flooring requirements across the Gulf region has seen Flowcrete Middle East’s recent projects range from supplying heavy-duty surfaces for industrial environments to artistic finishes for luxurious hospitality venues. 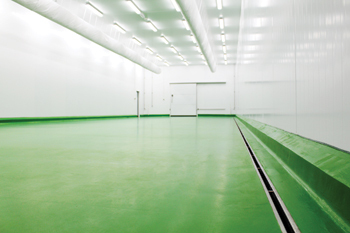 When Fit Fresh in the UAE required a new floor for its Dubai-based fruit and vegetable processing facility, the polyurethane resin system Flowfresh MF was installed. This solution was chosen, as exceptionally high hygiene standards are important for Fit Fresh to maintain the confidence of its many prestigious clients, including Emirates airlines, McDonalds and Qatar Airways. The seamless and impermeable nature of Flowfresh MF makes it ideal for upholding excellent cleanliness levels, as it facilitates the quick and easy removal of dirt and grime from the area. The antimicrobial agent Polygiene is also homogenously distributed throughout the system’s resin matrix. This additive is able to target 99.9 per cent of bacteria on the surface of the floor. Flowfresh MF was also chosen as the ideal solution for the kitchen and back-of-house areas of Zuma’s new Abu Dhabi restaurant, thanks to its ultra-hygienic, high performance credentials. 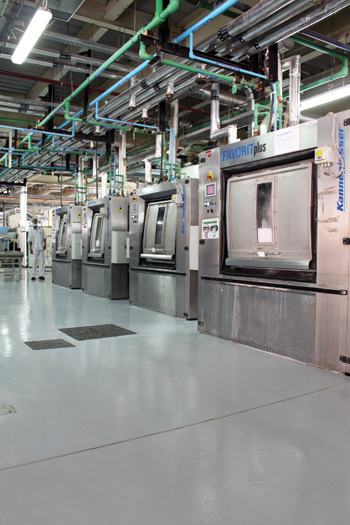 Linencraft facility ... Flowcoat SF150 employed. In a contrasting industrial context, Linencraft’s dry cleaning facility at Dubai Investment Park in Dubai, needed to refurbish its floor with a solution able to cope with the site’s operational workload, which involves processing 92 tonnes worth of linen daily. Not only would the floor have to withstand an intense amount of wear, but it would also be exposed to spillages of corrosive chemicals. To meet these challenges, the high-build, epoxy coating system Flowcoat SF150 was applied, as its enhanced chemical and abrasion resistance would be able to withstand the on-site conditions for an extended period of time. Within the spa of the new Sofitel hotel in Downtown Dubai, an entirely different set of priorities determined the choice of flooring. The hotel owners needed a floor that would convey the bespoke, luxurious and highly stylised nature of the venue. Durability was still an important factor, as a failing floor would tarnish the site’s aesthetics, reputation and hygienic integrity. To achieve this look, the spa installed 700 sq m of the seamless epoxy terrazzo finish Mondèco Earth in a custom-made off-white colour. Mother-of-pearl aggregates were incorporated within the resin material to create a shimmering lustre across the floor’s surface. A common factor among the Gulf region’s commercial, large-scale developments is the necessity to have high-volume, multi-storey car parking facilities to accommodate the influx of visitors. This was an especially high priority for The Beach, a new retail complex in Dubai. The mall’s developers wanted car-park deck and wall coating solutions that would not only prevent water ingress and face up to constant heavy traffic and corrosive automotive oils, but would also do so while presenting an aesthetically attractive appearance to arriving visitors. To achieve this, the architect worked with Flowcrete Middle East to apply 70,000 sq m of the car-park deck coating system Deckshield ID and 85,000 sq m of the wall coating system Deckshield Concrecoat. * Flowcrete Middle East is a leading manufacturer of seamless resin floor and wall coating materials, traffic deck coating systems and cementitious screeds that have gained popularity throughout the region. Part of Flowcrete Group, an organisation with manufacturing and sales centres across Asia, Europe, the Americas and Australia, Flowcrete Middle East offers local clients the backing of a major multinational manufacturing group.